1. Starting to remove the front panel of the boiler. 2. Front cover opened up to access the firebox for cleaning. 3. Front panel cover on the grass, with the boiler side facing upwards. Note that the insulation on the cover is in poor condition. In other boilers this insulation is not exposed but is protected behind metal. The water found later in the fire box may have caused the insulation to fail sooner.This is replaced later, see photograph 8. 4. Removing the steel plates above the fire box to allow cleaning. 5. 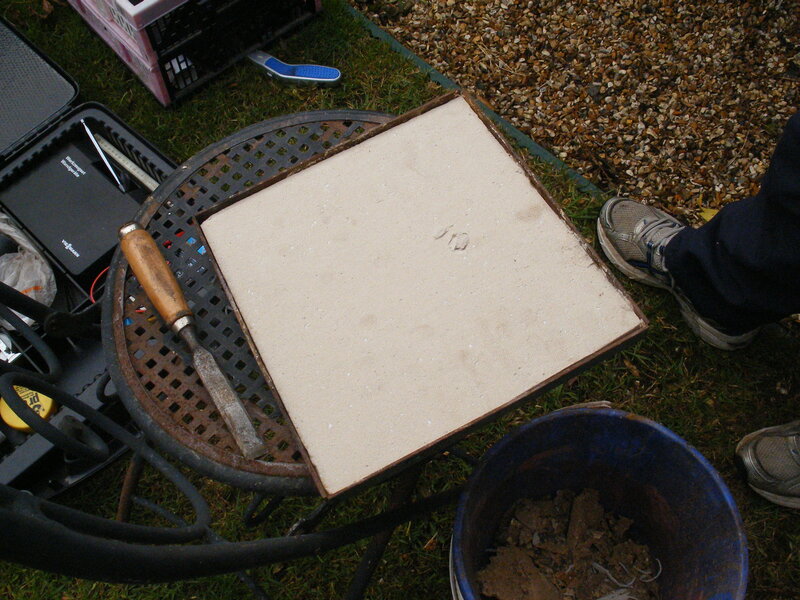 Plates nearly all removed, note snail shell on right hand side plate. 6. 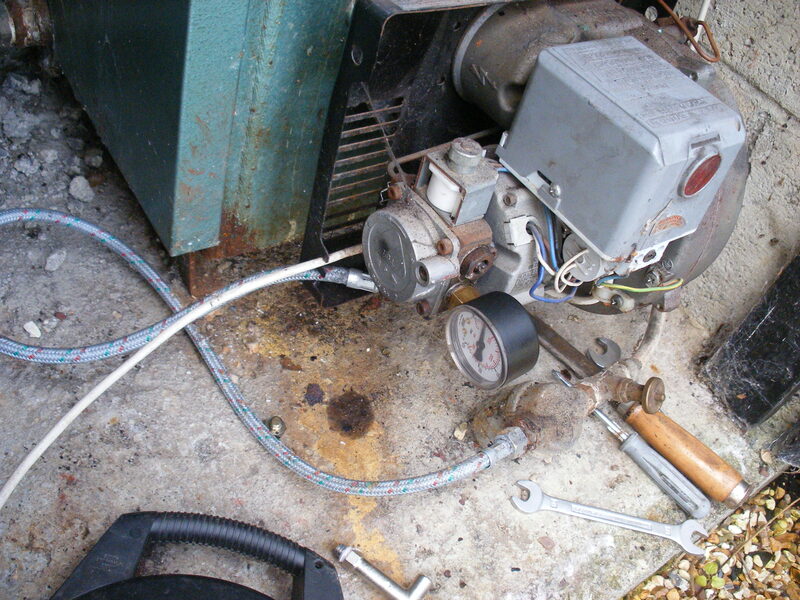 Burner removed from boiler, note the oil nozzle at center of burner, this is replaced later. 7. The body work is scraped as much as possible. The debris were removed from the fire box below by hand. Then a vacuum cleaner was used to clean out the lower firebox. But in my case, as stated previously, water was lying in the bottom of the firebox. Therefore the water had to be removed first. Kitchen roll and rags were used to do this, as other wise the vacuum cleaner may have been damaged sucking up water. 8. Replacing insulation to front access cover, removal of old and replacement of new. 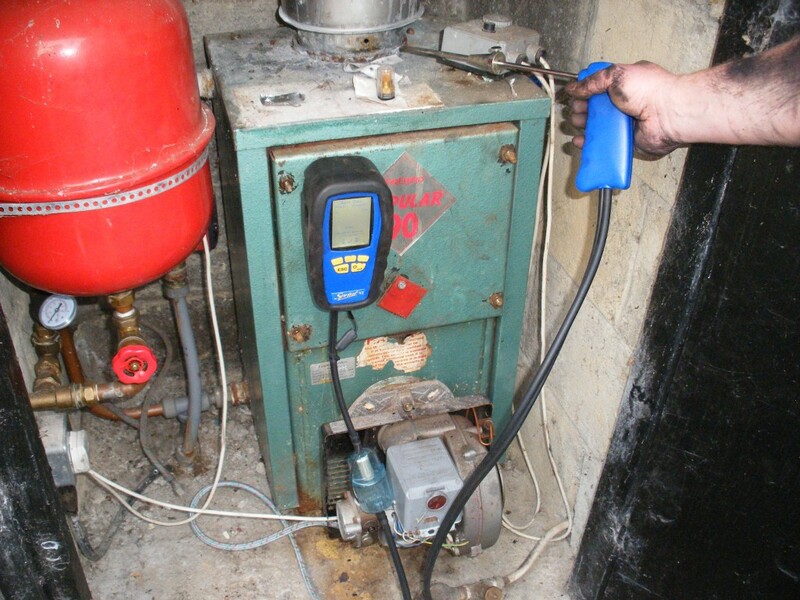 The flue gas properties were checked for efficiency by drilling a small hole in the flue, turning on the boiler and inserted a flue gas analyser. This was left in and the air intake settings were adjusted to increase the efficiency. This step was done prior to step 9 (before the nozzle was replaced as the results indicate that the nozzle was dirty) and then redone afterwards. The small test hole drilled in the metal flue was taped up with aluminium sticky tape. But this should only be done after the flue has cooled to avoid burns. The photocell needed to be replaced also as part of the service. I hope this was helpful to show how much work can be involved to service a boiler properly. 1. The cover should be on the burner to get more accurate air intake readings and prevent excess air readings. 2. The hole drilled for testing the flue gas should be at least 150mm above the boiler spigot. Without seeing your situation its hard to comment, but in general I think you could do either. My preference would be to drill it inside as you are covering the hole with tape. Then the repair is kept out of sight, note the article gives a distance to drill the hole. How do you bleed it? The thermostat unit (plastic housing shown on top of boiler)is damaged on my boiler. Will any similar unit work, or do I have to get the exact same part. How do you repalce this part. This Information is quite helpful,however I have just one question,can you tell me why my burner does not always fire up,when the red light is pressed it starts up fine,other than that the system runs fine. I have a Firebird Popular 90. Is this all thats required to service a boiler or is there oil / air filters to clean? If so, where are they and how is it done Please? Also my boiler is really black compared to yours. All above the burner and on the front cover. Why is this? I had to get a new pump last year and I asked the plumber, he said its nothing to worry about. But comparing your pictures to mine, your looks new. Mine is approx. 15 years old maybe more. That sounds like something I would worry about. Maybe a seal is broken or the settings need adjusting. Anyway its not possible from this distance to diagnose the issue so perhaps you should get a second opinion from a qualified boiler installer/ service person. Very helpful. As Andrea asked, is there any oil filter or air filter to be replaced? There is an oil filter on the oil line, not inside the boiler. To clean this the oil line needs to be closed off at the valve and the cover plate of the filter removed and the filter replaced. This is a dirty job. Then the cover plate screwed back on and the oil line opened up again, the boiler may need to be bleed after this job as opening and cleaning the oil filter will probably have introduced air into the system. There is no air filter as far as I am aware. Good to know. I completed the service as above, on the newer Firebird Enviromax C44 popular boiler, a quick question about flue emission post service. This was the first ever service (installed late 2010, very little soot, alot of liquid at bottom), does the flue gas tend to be smokier after a service (possibly burning off the little soot left over). I remember before the service, flue gas weren’t that strong, now it has a much stronger oil burning smell?? I also remember the plumber saying that because of the efficiency of this boiler very little residues in flue exhaust gases. Hi. If the boiler was damp/wet there might be steam in the flue gases for a while until it all drys. But this should only last for a short while. A smoke test should have been carried out as part of the service. So I would get the service technician back to check it all out. Also get them to check why the boiler was wet in the first place and repair if necessary. Best of luck with it. It sounds like you have a air supply problem. Possibly the air intake manifold is not engaging when the boiler is switched on. I suggest you get a service technician to take a look at it and rectify the problem. Always better to do smoke test prior to using analyzer, protects oxygen cell.I would test from not to distant out side, if access point not inside. Always check new nozzle is for gas oil, kerosene or both. Too much air intake will sometimes cause ignition problems, that could explain removing baffles improves ignition maybe. You could carefully test burner outside boiler by pointing in safe direction and covering front of blast tube to satisfy photocell. I fired up my boiler yesterday after nearly 6 months of not requiring it, tank was filled, did the usual things like bleed the air. Eventually she fired up and was working fine for 5/6 hours ,now when I switch it on, the pump is working fine but the burner won’t ignite, have bleed it again and no joy. The pump is staying on but the burner won’t ignite, what would the issue be? I had a similar problem to this yesterday, and it was the ignition coil which had short circuited, and had also blown the control box (with the reset button). For the last week or so it was firing sometimes, and sometimes not. It finally blew yesterday. Could also be a loose connection. Did he clean the electrodes etc? Make sure there is no water in fuel line-water can collect i n bottom of oil-storage tank and needs draining off. Happened me once-bled almost a litre of water . You,ll know by colour when water is drained. I have a Firebird Popular 90 Boiler and my radiators are full of air, I have bled them regularly but there has been no improvement. The downstairs radiators are working fine, the problem is just with the upstair ones. Have you any ideas what is causing this issue and any advice as to how to fix it. The most likely explanation is that you either have a leak in your system or your feed tank water level is low. Air in your radiators will shorten their life as corrosion will quicken. I would suggest you check the water level in your feed tank, then check for leaks in the system and then call your local plumber. Maybe there is a small bit of air still in there? 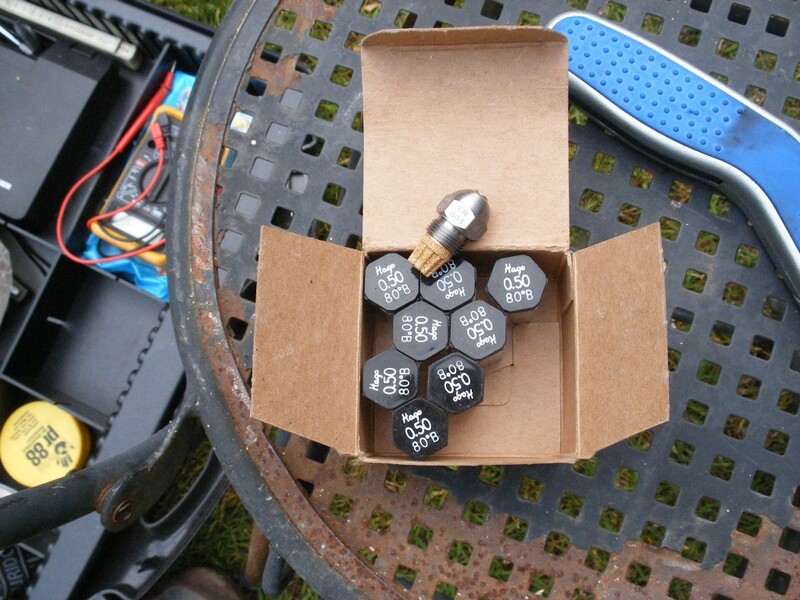 Did you try opening the bleed nut (allen key) slightly while firing it up? This should push any air out but BE CAREFUL this will spit out kerosene also. I have a Firebird 90 furnace about 10 years old that has been serviced annually. I am converting to Natural Gas and would like to sell (or donate to a worthy cause) the Firebird . What are the things to be considered in removing/transporting and reinstalling? I don’t want to get into this if there is a risk of damaging in the removal. Great site – very effective! I have a problem with my my firebird 90. The air intake opens properly but when it attempts to fire up it will light for just a second before going extinguishing, it repeatedly tries to fire but keeps going out after a second. I do not think it is air locked. I have a tap type regulator on the fuel line, what is it for. I have a problem with my my firebird 90. The air intake opens properly but when it attempts to fire up it will light for just a second before extinguishing, it repeatedly tries to fire but keeps going out after a second. I do not think it is air locked. I have a tap type regulator on the fuel line, what is it for. As a boiler engineer i would advise anyone with a boiler inside their house to get a carbon monoxide alarm fitted. 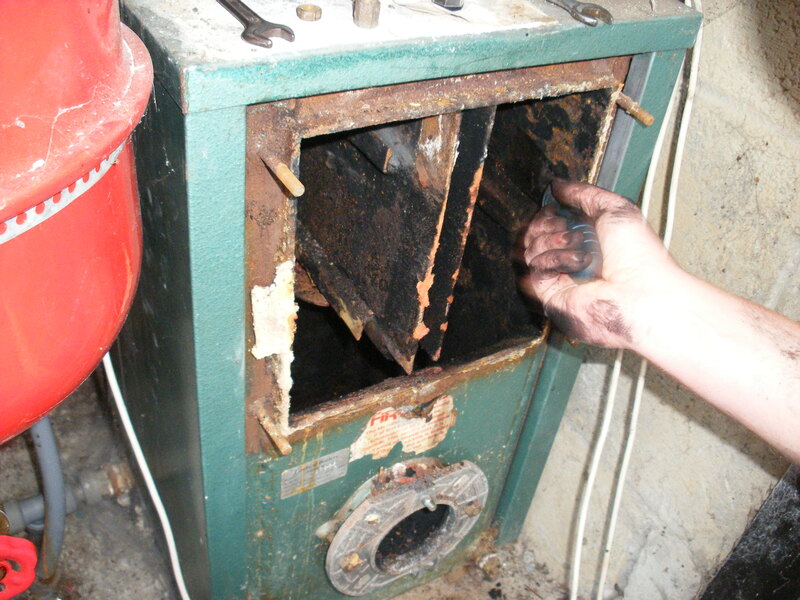 Any black soot in or around the boiler is a sign of incomplete combustion which produces carbon monoxide. As a boiler technician i would advise anyone with a boiler inside their house to get a carbon monoxide alarm fitted. Any black soot in or around the boiler is a sign of incomplete combustion which produces carbon monoxide. The cera-board insulation on the boiler door acts primarily as a seal to contain the hot gases within the heat exchanger. This is why it is exposed. Sometimes a rope seal (made of glass fibres ) is used instead or in conjunction. A burner that is cutting out and re-firing is being starved of air. Check that air intake and fan are clear of debris. 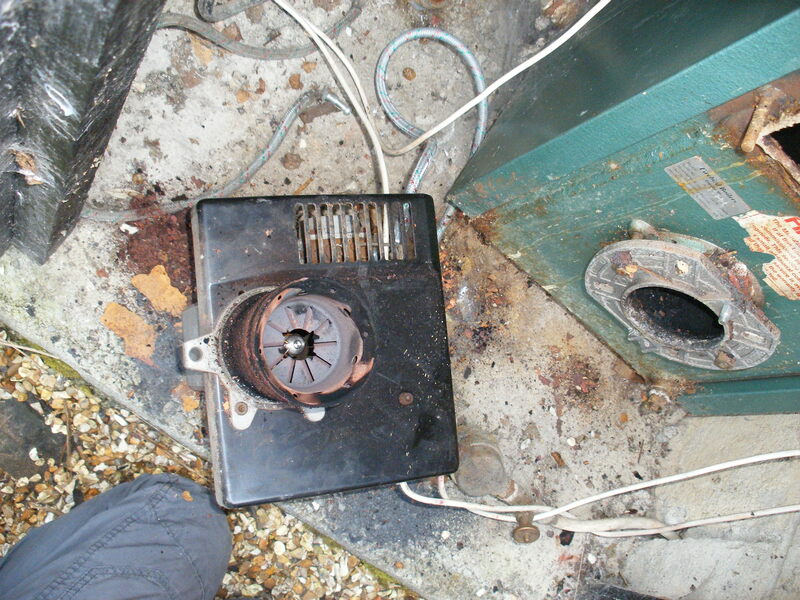 Sometimes balanced flues can leak exhaust gases into the air intake when seals perish. Also oil pressure setting on pump may be too high. How can I check or adjust oil preassure. You can buy a glycerin filled pressure gauge from most plumbing suppliers for about 15-20 euro. These screw into the port where you bleed air from the pump. Pressure for a standard domestic boiler should be 8 bar. Had a problem with water in tank fixed that New nozzle and burner now working fine But when put into boiler it’s miss firing I cleaned firebird out and burner started happy days. 3 hours later its cutting out and soot in boiler again any ideas ?? Soot= incomplete combustion. Not enough air or too much fuel. 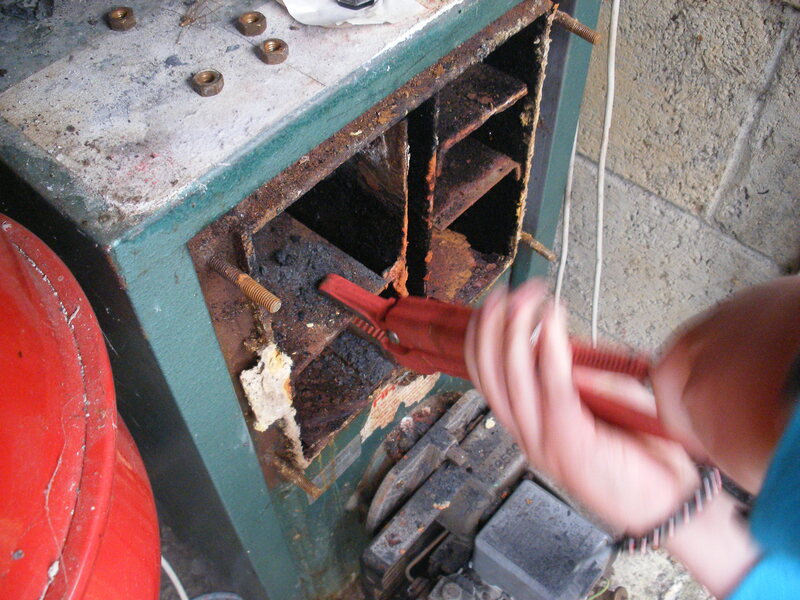 Burner also needs to be stripped, cleaned and tested as soot in boiler is a symptom of problem with burner. Does anyone know how servicing a boiler yearly effects the efficiency (long term). Looking at any websites these days tells you that if your boiler is over 10 years old it is down as low as 70% – 50% efficient. Granted they don’t state any servicing info an they usually try to sell you a boiler 2 min later. So how much truth are in these statements? How long should a boiler last you if serviced yearly (or more often if required)? Not sure but in my case, I have a 17 year old boiler which is serviced regularly and gives me approx 74% efficiency, based on the flue gas analysiser. The combustion analyser gives you combustion efficiency, not boiler efficiency. A common mistake. Did you check our previous article out? You should be able to work it out based on that. Click here. Hi, I checked the previous article and instead of 1.20 per hour I was spending 2.80 per hour I called a technician. He had a look, said it was fine and increased the oil pressure. Now is spending more than 3 per hour. Any ideas? There are no leaks and the tank has a lock. Is the oil nozzle the same size as the one in the article? Is your home well insulated? What size is you house, mine (the one in the article) is a 3 bed semi. If your home is large, badly insulated, with a boiler with a larger nozzle this might explain most of the difference. Thankyou for the quick reply. The sticker says the nozel is 1.6 – 3 ph I’m assuming thats 1.6 ltr per hour. It’s a 4 bed detached but we have it on timer and it only runs 6h per day…. 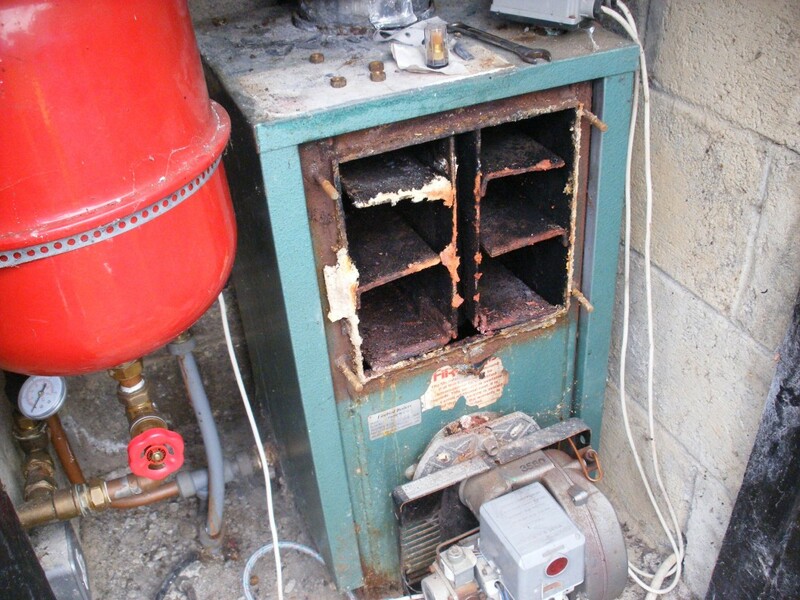 U Hi, I am looking to get my oil burner serviced properly and I am located in new Ross, co. Wexford. Do you happen to know anyone in the area ? What should I expect to pay ? I would imagine around €70 – €80 for a decent service with the kind of checks detailed above. It should take at least an hour to do properly. Less time than this will not be thorough enough. I cant recommend anyone in the New Ross area. I have firebird popular 82, I have cleaned out the combustion chamber and found the top insulating has all broken away and also have found what looks like loose fire cement at the bottom of the chamber. Do I put fresh fire cement at the bottom and where do I get new insulating for the top. Many thanks Brian. If you log onto http://www.oftec.org/, you can enter your County, and a list of OFTEC certified boiler technicians in your area will come up. You can then contact them to arrange the repair. Not blocking the air intake of course. I am not sure. The boiler is insulated anyway as part of its construction, so the benefit of adding more would probably be minimal. I wouldn’t add more myself as it would possibly void Firebirds warranty. You should contact their technical department and check with them. It sounds like your pump is acting up. You should get a plumber to have a look at your whole system and boiler. I serviced mine as best i could from your instructions. I too need a new insulation panel. But I have a leak and I don’t know how to stop it. It is coming from the brass coloured cylander which has the copper chord attached to it. Do you know what I mean? It looks like it might be supplying fuel to the burner. The leak seems to be from the underside if this unit. Hi I have firebird 90 in outside shed, riello burner too, can you give me an idea as to the average kero consumption per hour for the boiler. I have it on the 60degree setting. 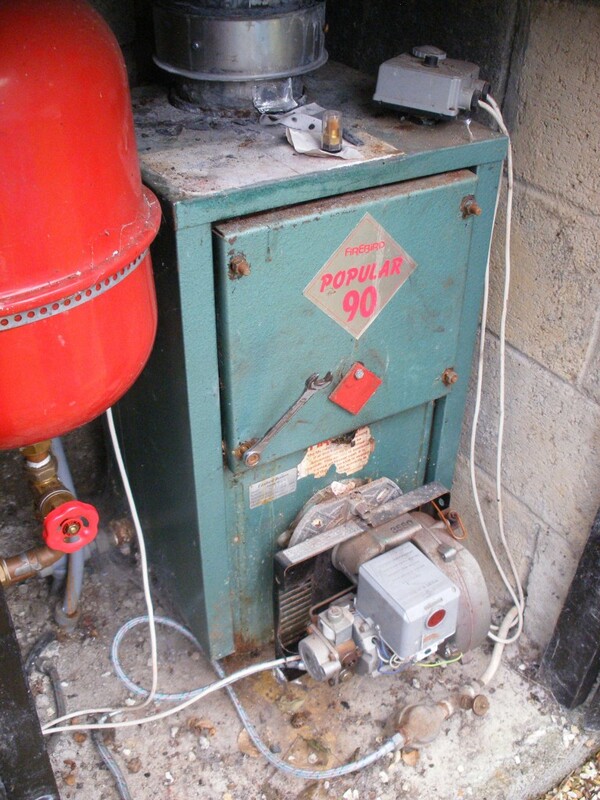 Firebird outside oil boiler in its own galvanized box unit approx. 15 years old. 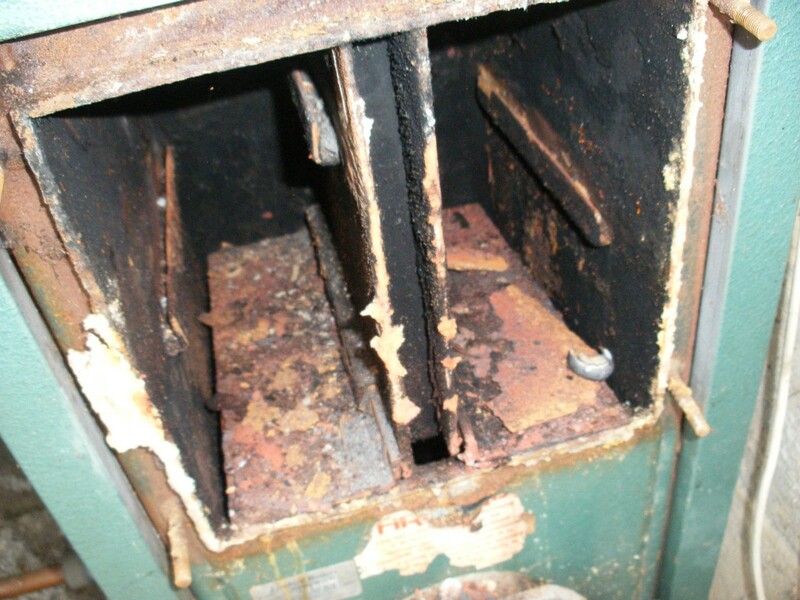 Recently boiler cutting out after a short time and not heating thereafter. I have been able to re-start using the restart button but again it cuts out after a short while. Today I had a service engineer have a look but he could not exactly find the problem. He put in a new nozzle and fired up boiler and checked boiler efficiency by measuring flue gases. It is burning at 95% efficiency but unfortunately it is still cutting out after approx. 30-45 minutes. Any suggestions as the what could be causing this cut-out problem as the plumber is suggesting replacing parts with I think second hand parts. I am not convinced this is the way forward. The boiler and housing are in excellent condition for the age of the unit. the firebird popluar 90 in the house we bought is missing all the baffle plates. we had it serviced and plumber told us this, and that we’re losing 50%+ efficiency due to this. it’s dated at about 20years old, can we get a welder to make new plates? if so, do you know the dimensions and shapes they need to be? Contact your nearest firebird stockist , they can order in for you. If you have serial number of boiler and details it will make it easier for them to order. The baffles varied slightly over the years.so any info you have will help. You need to have burner cover in place to analyse the boiler correctly. 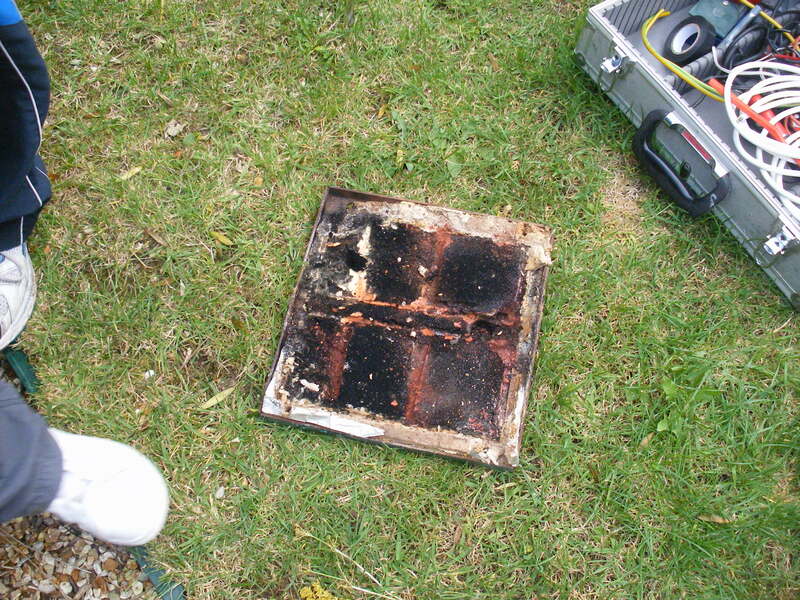 Your readings will change when you put the burner cover back on. Regards pat. Just wondering if it is possible to reduce the noise level from the boiler when it foires up. I’m talking about the hummm from the burner through the flue. I have a combination 90 indoor unit and may consider changing for an external unit in years to come and insulate the housing for noise and heat loss…although I assume some level of airflow would still be required for ventilation/air supply..? Also do you have a name for a “great” service engineer in the north cork area…? Has diesel (gas oil) got a higher calorific value than kerosine and is it cheaper and therefore would conversion to green diesel be worth considering to heat my house. I know the pressure needs increasing and the nozzle reduced in size and does this mean the same volume of fuel is used in both systems. Excellent Post and great shared to oil boiler and flue gas. Cheers author for your helpful blog and outstanding article to Plumbing service. I appreciate your effective content and information. I have a Firebird c35kw condenser boiler. The timer was set to heat the water but as soon as the set time was reached the fuse for my sockets tripped. However when the set time for the heatest is reached, the boiler starts and the heat comes on. I have been waiting on my plumber to call for the last four days now. Can you advise me what to check. Just a quick one, do you know the partnimbet for the baffle door insulation and seal for the 82 ? I’ve a Popular 115 unit and the heating system has 3 circuits – hot water, ground and first floors. The motorised valves are manufactured by Sunvic and one fails about every 3 years, but I get them refurbished by a chap in England. The system is pressurised. Every year we find once we adjust the timings when winter comes along, and also increase the thermostat setting on the grey on top of the burner, the system intermittently fails to ignite yet pressing the little button on the grey thermostat box gets it going again. The condenser has been replaced and the pressure is OK (inside the green band on gauge) – any ideas as to the fault? Also can the Sunvic valves be replaced with a superior type without changing the base that’s inserted into the plumbing – to replace with more reliable units would be sensible I feel. We have a Firebird 90 running on ordinary kerosene with the following problem. The burner starts with ignition as normal. Instead of the ignition continuing until the correct operating temperature is attained, the burner continues to run, however, the ignition cuts out, then reignites, then cuts out, reignites etc until the system reaches the correct operating temperature. Once the temperature decreases the burner starts with the same ignition sequence. firebird 50/90 making a whineing sound fairly high pitch. 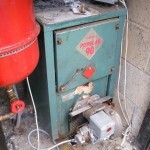 I have firebird super q 90 boiler. It fires up but cuts out to lock out after a few seconds! I have tried bleeding it several times and pressing the red button many times ! I’ve cleaned the boiler and flu, checked that the magic eye is clean! My tank is about 1/3 full of oil! Just wondering where to buy the cera-board. I have the same boiler type with deteriorating door insulation. Thanks. Firebird enviromax 3yr old Serviced fail to stay on longer 20 seconds after service . System tested outside of unit works . Just not when inserted . I didn’t know you should only have a qualified individual help service your furnace because of how much knowledge and experience was needed. My oil furnace has been acting up lately and I think I am going to have to find a service to come out and check it out. I may, in the end, need to find a new furnace.